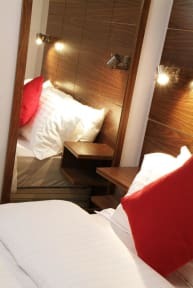 Each cocoon at the Cocoon @ International Inn offers a conceptualized, stylish, compact space within an internal cabin with all the comfort and amenities needed for you to sink back, relax and enjoy your stay in Liverpool. 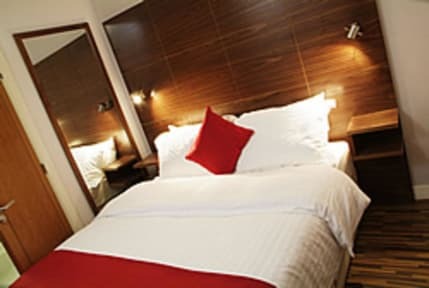 The award winning team behind the International Inn understand that when you choose to visit Liverpool, it is the famous sights and sounds of the city that you wish to explore. We want to provide you with the exceptional comfort and value for money accommodation that will enable you to unwind, take it easy and recharge your batteries. Welcome to our Cocoon rooms. Please use the group section in HostelBookers/Hostelworld if you are 10 or more people. Intimate internal cabins, each room is encased in American walnut with king size or twin beds, quality bedding and beautifully fitted Ensuite bathrooms with huge rose head rain showers. We have writing desks, luggage storage space, open plan wardrobes and secure safety deposit boxes in all rooms. Housed in a new building with modern slate facade, each apartment is tastefully furnished to a high standard, offering you all the modern facilities you require to enable you to enjoy your visit to Liverpool in the utmost of comfort and privacy. The ideal flexible alternative to staying in a hotel. Please note that upon checking in valid credit card details or cash deposit are required for the apartment bond. Each private apartment has a cosy, stylish, open plan living area with chocolate brown leather sofas, balcony doors and digital television with DVD player. There is a modern, fully equipped kitchen with all cooking facilities, a fridge and a breakfast bar for dining. We also provide you with fair trade tea and coffee. The bathrooms all have electric showers, toilet and washbasins. No bath. All cotton towels are provided for you. Should we not receive this up to 48 hours prior to arrival, your booking will automatically expire from our system. Please use the group section if you are 10 or more people. Please note that upon checking in valid credit card details or refundable cash deposit are required for a bond. Please note that after booking you will be contacted by the property in order to provide further details to fully secure your booking. Great location close to concert square. Room was clean and is a great base for enjoying Liverpool. Would definitely stop again! Arrived to the hotel and was told I booked a double bed room when clearly stated on my booking with hostelworld that 2 bed apartment with ensuite. There also was no ensuite in the room. One of my party had to then sleep on the floor with a provided mattress. To say I wasn’t happy is an understatement. I will not book with the website again.